Mirri Sparkle paper adds a fun twinkle to any paper craft project. 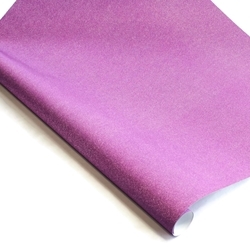 This metallic purple paper has a smooth texture and is glitter free. Each sheet of Purple Wild Orchid Mirri Sparkle Paper casts a glittering deep violet sheen across the entire sheet giving the impression of a field of flowers after a summer rain. The paper weighs 140 gsm and can be used in offset printing, but it is not inkjet or laser printer compatible. Enjoy large sheets measuring 24.5" x 35.25" or smaller 12" x 12" and 8.5" x 11" sheets.